Kogatende area, the place where the real meaning of great wilderness experience of wildebeest migration ends their circulation in Serengeti, and dare to cross the deadly crocodile Mara river heading to Maasai Mara game reserve. This safari will make you witness the world natural phenomena of great migration under luxury professional service from African DMC. Light flights from one part to another will be included. In the morning after hot breakfast at Duluti Serena lodge, driver guide will take you with your packed lunch boxes heading to Kilimanjaro/Arusha airport for flight to Serengeti. After 1 hour you will reach central grass plain the Seronera region where our driver guide will pick you from airstrip ready for the game drive. Serengeti is famed by its natural phenomena of great wildebeest migration and a large number of wilderness big cats. Other animals commonly found in the park include topi, eland, hartebeest, buffalo, elephant, caracal, serval, bat-eared fox, hyrax, genet, hares, porcupine, aardvark, giraffe, jackal, mongoose, crocodile, monitor lizard, aardwolf, many kinds of primates including baboons, vervet and colobus monkeys, and over 500 species of bird. You will reach Seronera in the afternoon, after lunch, you will explore game drive at Seronera central grass land of Serengeti, in the evening you will depart to Serengeti Acacia Tented camp for dinner and overnight stay. In the morning after breakfast at Serengeti acacia camp, you will be collected to Seronera airstrip, for the flight to Serengeti northern region, the famous Kogatende area. Arrive at Kogatende airstrip after 10mins, and then driver guide picks you ready for Mara crossing full day game drive. 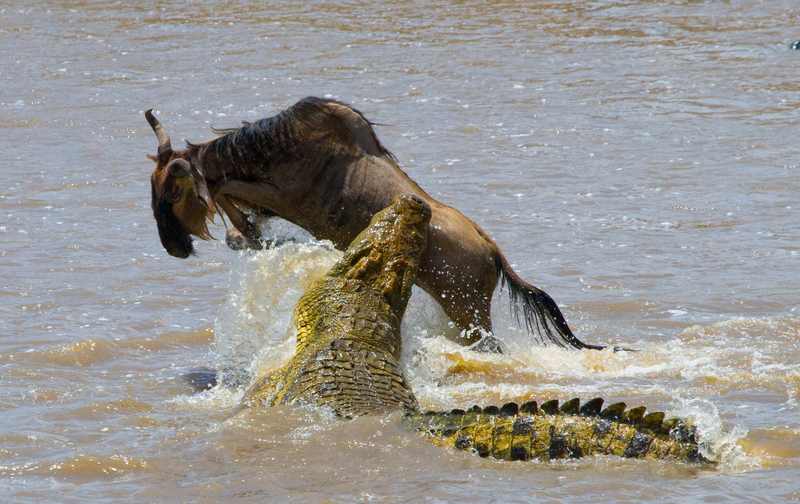 In this season great wildebeest migration together with Zebras, use to cross the deadly Crocodile Mara river heading to Maasai Mara game reserve, it is the great experience where you may witness hunting process of crocodiles of Mara river. In the afternoon you will enjoy your delicious lunch boxes at Kogatende picnic site. In the evening after the game drive, you will depart to Mara under canvas luxury camp for dinner and overnight stay. Meal and accommodation at Mara under canvas luxury camp. Proceeding with mara crossing game drive at Kogatende region, soon after breakfast at Mara camp, driver guide will take you to the private place where you will see animals crossing Mara river in the easiest and comfortable way. In the afternoon you be back to the camp for hot lunch and then proceed with game drive until evening when you will depart to the camp for dinner and overnight stay. In the morning you will enjoy your hot breakfast at Mara camp, and then driver guide will collect you to Kogatende airstrip for the flight heading to Kilimanjaro international airport for International flight back home, where will be the end of your lifetime amazing wilderness luxury safari.